Peptide QLYDKGYTSKEQKDC, corresponding to amino acid residues 557-571 of human TRPC1 (Accession P48995). Intracellular. Homology Mouse, rat, human - identical; rabbit, bovine - 14/15 amino acid residues identical; Xenopus Laevis - 11/14 amino acid residues identical. 1. Anti-TRPC1 Antibody (#ACC-010), (1:200). 2. Anti-TRPC1 Antibody, preincubated with the control peptide antigen. Human umbilical vein endothelial cells (HUVECs) (Ahmmed, G.U. et al. (2004) J. Biol. Chem. 279, 20941.). Immunohistochemical staining of mouse cerebellum frozen sections using Anti-TRPC1 Antibody (#ACC-010). 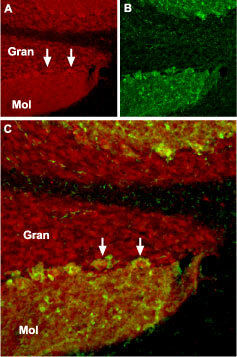 A. TRPC1 (red) appears in Purkinje cells (arrows) and in the molecular (Mol) and granule (Gran) layers. B. Staining with mouse anti-parvalbumin (PV) in the same brain section. C. Confocal merge of TRPC1 and PV demonstrates partial co-localization in the Purkinje and the molecular layers. BAE-1 (Bovine aortic endothelium) cells (1:200) (Antoniotti, S. et al. (2002) FEBS Lett. 510, 189.). Human U373 MG cells (1:80) (Barajas, M. et al. (2008) J. Neurosci. Res. 86, 3456.). Liu, X. et al. (2003) J. Biol. Chem. 278, 11337. Knockout validation of Anti-TRPC1 Antibody in mouse substantia nigra.Western blot analysis of mouse substantia nigra lysates using Anti-TRPC1 Antibody (#ACC-010). TRPC1 is not detected in TRPC1-/- lysates.Adapted from Sun, Y. et al. (2017) J. Neurosci. 37, 3364. with permission of the Society of Neuroscience. Anti-TRPC1 Antibody (#ACC-010) is a highly specific antibody directed against an epitope of the human protein. The antibody can be used in western blot, immunoprecipitation, immunohistochemistry, and immunocytochemistry applications. It has been designed to recognize TRPC1 from human, mouse, and rat samples. Immuno-colocalization of KCa3.1 and TRPC1 in mouse brain. Immunohistochemical staining of mouse brain sections using Mouse Anti-KCNN4 (KCa3.1, SK4) (extracellular) Antibody (#ALM-051) and Anti-TRPC1 Antibody (#ACC-010). YFP denotes neuroblasts. 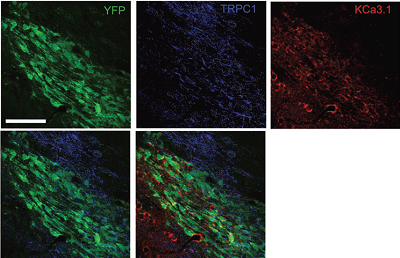 TRPC1 staining (blue) is detected in neuroblasts and outside neuroblasts as well (in astrocytes). KCa3.1 (red) is detected in neuroblasts. Merged image of all three staining (lower right panel) demonstrates the partial co-localization between the three. Adapted from Turner, K.L. and Sontheimer, H. (2014) with permission of Oxford University Press. Western blot analysis of human SH-SY5Y cell lysate and mouse brain lysate. Also tested on TRPC1-/- cells. Rat endothelial cells (EC) and smooth muscle cells (SMC). Liang, M. et al. (2018) Clin. Exp. Hypertens. 40, 39. Mouse primary cerebellar granule cell lysate. Du, T. et al. (2017) Front. Cell. Neurosci. 10, 305. Human SH-SY5Y cell lysate and mouse brain lysate. Also tested on TRPC1-/- cells. Human lung mast cells (1:200). Wajdner, H.E. et al. (2017) Physiol. Rep. 5, e13166. Wang, W. et al. (2017) Neurochem. Res. 42, 762. Human HepG2 liver carcinoma cell lysate (1:1000). Badr, H. et al. (2016) Front. Pharmacol. 7, 19. Du, L.L. et al. (2016) Mol. Neurobiol. 54, 1992. Human MCF-7 breast cancer cell lysate. Faouzi, M. et al. (2016) Oncotarget 7, 36419. Jiang, H.N. et al. (2016) Biomed. Pharmacol. 82, 20. Jiang, Q. et al. (2016) Am. J. Physiol. 311, C136. Rat PASMC cell lysate (1:1000). Lin, A.H. et al. (2016) Cardiovasc. Res. 111, 94. Mouse embryonic fibroblast cells lysates. Ryazantseva, M. et al. (2016) J. Neurochem. 136, 1085. Bertrand, J. et al. (2015) Eur. J. Pharmacol. 765, 337. Mouse Neuro-2a neuroblastoma cell lysate. Vigont, V. et al. (2015) Front. Physiol. 6, 337. Mouse MLE-12 lung epithelial cell lysate. Zhou, X. et al. (2015) Mol. Cell. Biol. 35, 16. Rat pulmonary arterial smooth muscle cells (PASMCs) lysate. Jiang, Q. et al. (2014) PLoS ONE 9, e107135. Human HT29 colon adenocarcinoma cell lysate. Sobradillo, D. et al. (2014) J. Biol. Chem. 289, 28765. Rat distal pulmonary smooth muscle cell lysate (PASMCs). Zhang, Y. et al. (2013) Am. J. Physiol. 304, C833. Rathor, N. et al. (2014) Physiol. Rep. 2, e12193. Human umbilical vein endothelial cells (HUVECs). Ahmmed, G.U. et al. (2004) J. Biol. Chem. 279, 20941. Martinez-Galan, J.R. et al. (2018) Front. Neuroanat. 12, 15. Turner, K.L. and Sontheimer, H. (2013) Cereb. Cortex 24, 2388. Boudes, M. et al. (2013) PLoS ONE 8, e69550. Human U373 MG cells (1:80). Barajas, M. et al. (2008) J. Neurosci. Res. 86, 3456. BAE-1 (Bovine aortic endothelium) cells (1:200). Antoniotti, S. et al. (2002) FEBS Lett. 510, 189. Cuddapah, V.A. et al. (2013) Cell Calcium 53, 187. Ng, L.C. et al. (2012) Am. J. Physiol. 303, C1156. Anti-TRPC1 (extracellular) Antibody (#ACC-118). This antibody recognizes a different epitope and thus can also be used as a control for detecting TRPC1. Anti-TRPC1 (extracellular) Antibody (#ACC-118). This antibody recognizes an extracellular epitope and can be used to detect TRPC1 in live cells.